"They are united by the love of God and willingness to serve"
Chucho writes, "It is for the lost who don't know the way, for the sick, the needy, those who are like sheep without a shepherd. 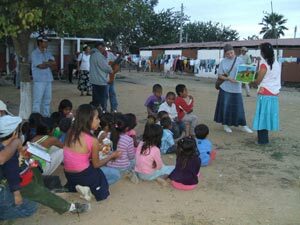 It is for them that each year we visit the agriculture fields and worker camps of Culiacan to bring hope and salvation." Beth from the United States joined the outreach for two weeks. Here are some excerpts from her writings. "The first week of February there were 2 nights of freezing weather that damaged 80% of the crops. Some of the migrant workers who had come for 7-12 weeks of work got only a few days of work - not nearly enough salary to sustain their families. Even the farms that had brought the workers on buses were struggling to find the money for the buses to return them. Even so, we reached several camps just before the workers were leaving to go home on the buses and were able to hand out CDs and Bible portions. Sometimes this was all we could do. 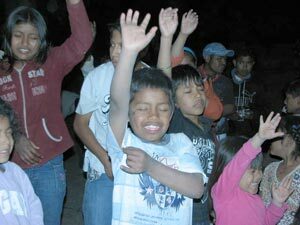 At other camps we had puppet shows for the children followed by movies about Jesus. While this was being set up and going, workers would go out by twos and threes to diagnose the indigenous language speakers and make copies of CDs for them in their heart language. Project Culiacan has 250 indigenous languages ready to distribute and is still discovering a few that have not been translated yet. These people are very needy in many ways. They live in squalid conditions and have few material possessions, but their spiritual needs are even greater. They are grateful for the CDs we hand out, as many have never heard of Jesus; the whole Bible story is new to them. They have lots of intelligent questions after seeing the movie. They request prayer. They do not read any language. They are grateful that God cares about them enough to send a few simple missionaries to show them a movie and share the good news with them. It is particularly heart-rending to see the children who come along with their parents. They are supposed to go to school, but many work in the fields with the parents. Some suffer abuse at the hands of adults in the camps. Missionaries for Project Culiacan are almost as needy as the people we minister to. Some have their trip financed by their financially poor churches. Some speak one of the indigenous languages as well as Spanish. Others speak only English but want to help. They come from different backgrounds and states, but all want to help. They are united by the love of God and willingness to serve. While I was there, between 35-50 people worked on the project. They are divided into teams to go to the camps so sometimes up to 5 camps would be visited at the same time if there were enough workers. For large camps, two teams would go together. All in all, it was a great blessing for me to be able to go to Culiacan and help". In January every year for the last 21 years, teams of Mexican and expatriate believers under the leadership of GRN Mexico have visited thousands of (Mexican) Indian workers in the rich farming area of Culiacan, bringing words of hope and life...and God works miracles! It happened again this year. Chucho, the Director of Buenas Nuevas (GRN Mexico) told us the story of Martin, a drug addicted Nahuatl Indian. Martin had been given a GRN CD at the place he came to collect his pay. A few days later he met up with one of the teams and told them his story. "That day I was depressed and sad. I had many problems because drugs were destroying me and my family. I planned to kill myself after picking up my salary. But when I got back to my room, I had in my hand the CD I have been given so I listened to it. It was in my language and spoke to my heart. I listened right to the end. When it was over I said to God 'If you are real, please help me. Please give me another chance'. I suddenly felt very tired and fell asleep. In my sleep I dreamed and saw a bright light. A voice told me 'You will have more time with your family'. When I woke, I realised that God had spoken to me. I knew he was real." Numbers were down this year (2011) but more than 75 people participated at some time during the month-long mission. 90 camps were visited and 3 refused us entry. 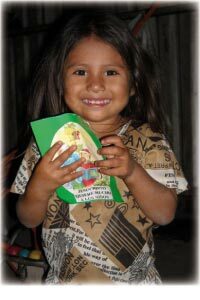 More than 6000 CDs in Spanish were given away and another 6,800 CDs were given out in 110 indigenous languages. 3,600 people made a decision to follow Christ. To God alone be the glory! Please pray that the new believers will be able to stay strong in their new found faith as they go back to 'normal life' in their villages. 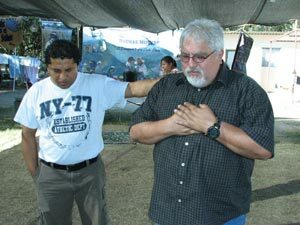 Pray also for Culiacan 2012. Planning is already under way and there are many more who need to hear words of hope and life.